The most obvious way to get some sound out of a singing bowl is to strike it with a striker. Striking has to be done at or close to the rim, as this brings out the best sounds. You have to find out for yourself at what angle to strike the bowl to get the most out of it. You will notice that each time you strike there is a slightly different sound effect. It all depends how you strike the bowl, and that will be different with each strike. Hitting a singing bowl with a striker needs to be done gently, with love. More force will not produce more or stronger sounds, and you do not want to break or crack the bowl! Never strike hard with an bare unpadded piece of wood. That part of the striker is for rubbing around, not striking. 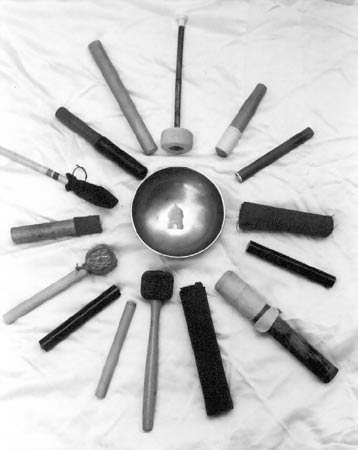 You can use many strikers, depending on the size and composition of the singing bowl. The first thing to do is to get or make a series of wooden strikers of different diameters. There is no fixed rule about what works, experimentation is the key. If you tap the bowl very gently with bare wood it will enhance the higher partials. Wrapping cloth around the striker will bring out the lower partials and the fundamental. The more layers of cloth, the lower the sound. Try both thinner cottons and thicker woolens or felt and leather. Harder woods (wrapped with cloth) often generate harsher sounds when used to strike the bowl, so look for softer woods. Larger bowls require a thicker, heavier striker with more layers of cloth, leather, or felt. Another kind of striker is soft drum mallets, they come in different sizes and are worth having. Some are made for use with frame drums. For really big bowls use a base drum pedal beater from a drum set. It has a big felt top and it brings out the beautiful low sounds of big bowls. Every singing bowl is a unique handicraft, and you have to experiment to find out what striker works best with what bowl. Don’t be dependent on what you can buy, making your own often is the best.